75 days. Solanum lycopersicum. Open Pollinated. 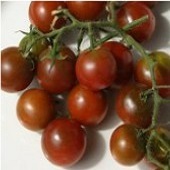 Plant produces high yields of 5 to 7 oz purplish-red plum tomatoes. They are meaty and very flavorful. 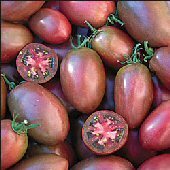 One of the best tasting purplish-red tomatoes. Perfect for salads, slicing, salsa, sauce, puree, paste, and canning. Also known as Ukrainian Purple Tomato. Crack resistant. Always a great seller at Farmer’s Markets! Excellent choice for home gardens and specialty market growers. A heirloom variety from Ukraine. Indeterminate. 5 stars for flavor -- Very juicy and sweet. It has a bit more juice and acid than a Brandywine. Absolutely delicious in a salad. 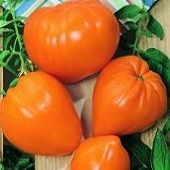 It look like a paste tomato but it is not a paste tomato. I am giving it 4 stars because it was the first to catch late blight. The leaves on this plant always curl -- this is normal and not a sign of disease. These are awesome. Great flavor, huge plants, and an excellent keeper which ripens well off the vine as well (important in short damp climates like here in the Pacific Northwet). Listen to the commenter who said "the leaves on these always curl" - they looked so sad early in the spring that I moved them away from the rest of my tomatoes and almost threw them out. But then they took off and overtopped even my 5' cages, LOADED with clusters of fruits.